The community/population health/public health nurse is charged with promoting the health of populations, not only the individuals within populations. This requires advocacy on the part of the nurse, for entire communities as well as for the individuals within. 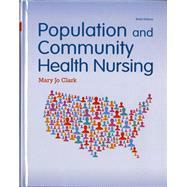 The long-awaited sixth edition of Population-based & Community Health Nursing by respected leader and educator Mary Jo Clark has been thoroughly updated with an even stronger population-based nursing approach. Population-based & Community Health Nursing, 6e continues to approach population-based/community health nursing from an aggregate perspective, clearly showing how nurses can serve to improve the health of populations within a community by functioning as advocates on many levels. To illustrate how that can be manifested, real-life vignettes begin every chapter, showing students what advocacy looks like in the public health context. In each chapter, clinical reasoning exercises are woven throughout in boxed features. Mary Jo Clark, PhD, RN, PHN, has been practicing and teaching population health nursing for 50 years. After completing her BSN degree at the University of San Francisco, she received her introduction to global population health nursing as a U.S. Peace Corps Volunteer in Vita, India, a rural town with a population of about 3,000. Returning to the United States, Dr. Clark employed her cross-cultural expertise as a Public Health Nurse in the Los Angeles County Department of Health Services. In 1973, she became a pediatric nurse practitioner, and later began teaching population health nursing at East Tennessee State University. She completed a master’s degree as a community health clinical nurse specialist at Texas Women’s University and a PhD in nursing at the University of Texas at Austin. Moving with her army nurse husband to Augusta, Georgia, she taught graduate and undergraduate population health at the Medical College of Georgia. For the past 29 years, Dr. Clark has taught at baccalaureate, master’s, and doctoral levels at the University of San Diego, Hahn School of Nursing and Health Science. In addition to her full-time teaching and writing, Dr. Clark has maintained an active population health nursing practice. She is well known in the population health nursing field and has provided consultation and made presentations across the country and overseas. Her many and varied experiences in population health nursing in the United States and abroad form the core of the material presented in this book.